There are many howto's on this subject out there, but since I ended up blending a few of them to get exactly the environment I wanted setup (and took notes so I could repeat this), I thought I'd blog it for future reference, and hopefully this info is useful to others. 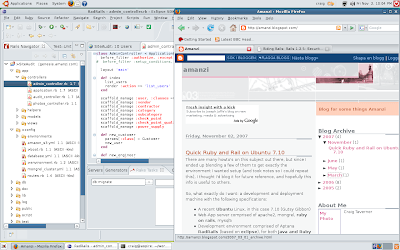 Development environment comprised of Aptana RadRails (based on eclipse), for both Java and Ruby on Rails development (I use Java for other projects, but also plan to do some JRuby work), and since eclipse rocks, I use it for everything I can, even rails. If you don't want java development, you can use the pure Aptana IDE, but then you also loose out on CVS support). Some additional libraries for graphics and charting support in the rails apps. eclipse (for 3.2 support in ubuntu 7.10 and 8.04) - to get eclipse 3.3 or 3.4 you need to download it from www.eclipse.org. On recent versions of Ubuntu (like 9.04) you also need to install xulrunner as described at this link. This is to get around a library issue between SWT (in eclipse) and Firefox3.0. Modify Eclipse to use Java6 (based on http://help.ubuntu.com/community/EclipseIDE). For Ubuntu 8.04 and 9.04, this was not necessary, but I did it for Ubuntu 7.10 and earlier. To get projects inside eclipse to use java6, open eclipse and go to the menu 'Window->Preferences->Java->JREs' and select the Java6 JRE. I wanted ImageMagick for photo uploads and resizing in my rails apps, so I installed the ubuntu package for ImageMagick using synaptic, and then installed the rubygem 'mini-magick'. I had tried 'RMagick', but the gem did not install, and online help indicates that you need to re-install ImageMagick from source to get RMagick to work, so I opted for the simpler mini-magick. For charting support in my web apps, the popular approach of using 'gruff' wrapping ImageMagick seemed to generate a lot of help requests, so I went for the lighter approach of using client side flash as described in the following blog. For nicer color control, I installed pdf-writer to get the color-tools gem (and in case I needed pdf-writer itself for future development). Once you have created a rails app, using the usual 'rails myapp', you should consider adding a number of cool rails plugins. There are a huge number out there. Currently I'm using attachment_fu, will_paginate, acts_as_state_machine, restful_authentication and ext_scaffold. See some of my more recent blogs for some more info on these. Miscellaneous. I also changed my ubuntu font sizes down to 9pt on 'system->preferences->appearance' to get a bit more screen real-estate on the laptop. Windows uses smaller fonts so it looks better (to me), especially when developing in an IDE like eclipse where it is nice to have many panels open together. And for some reason the Ubuntu install had visual effects disabled (Composite extension not available), so I needed to edit /etc/X11/xorg.conf and change the "0" to a "1" on the Composite line near the end of the file. And I changed the theme to 'glossy' but with 'human' icons and darker colors. Looks cool now! And of course the required screenshot, this one is of the Acer laptop with firefox showing this page and eclipse with a Ruby on Rails application in production (ubuntu 7.10). I confirmed that this works fine on Ubuntu 8.04 (Hardy Heron) Beta. I also noticed I forgot to mention the actual installation of eclipse. I did this both through the ubuntu packages (eclipse 3.2) and through manual download for eclipse 3.3. (but only 3.2 provided the aptana updates described). Updated instructions for rubygems 1.0.1 (was 0.9.4 in original post). This involved a new wget url, an additional manual soft link and the deprecation of the -y option. Thanks Craig for a wonderful guide. I've tried a dozen of guides but this is the best. With your guide I succeed to install rails on my laptop but I got an error-message on my desktop. I guess it is because I tried (on my desktop) all variant before yours and haven't successfully removed all files from it. Thanks Anders, for the positive comments. Concerning you desktop issues, if you have doubts about the integrity of your installation after playing around so much, perhaps a re-install is wise. Having said that, I think the error message you got gives a good hint as to the problem. It said 'no such file to load -- openssl'. If you look at the dependencies of the 'ruby-full' package, you will see 'libopenssl-ruby', and I would guess there is a good chance that that package is missing or corrupt (or rather libopenssl-ruby1.8, which is the real package that libopenssl-ruby represents). Try 'dpkg -l | grep openssl' to list what you have (I have libopenssl-ruby, libopenssl-ruby1.8, openssl and ssl-cert). Do this on both the latop (working) and the desktop (broken) and compare the results. Try re-install the packages. You could even trying removing openssl, and ruby and re-install them both again. Good luck. Thanks Craig for your advice! I guess I have no luck....with this. There were no difference between the lists. I've never seen that before, but a quick google search on your error message lead me to here. This seems to indicates that you might have a gem source for development gems, and you should remove it. The command 'gem sources -l' should only list the rubyforge source, and you can remove the rails source with 'sudo gem sources -r http://gems.rubyonrails.org/'. Since I do not have this problem, I'm not sure this really is the solution. Give it a try and otherwise search further with google. By default, Ruby will be installed under /usr/local. A simple which ruby should now point you to /usr/local/bin/ruby. A quick ruby -v should report the version and patchlevel from the downloaded Ruby source package. In our case it is ruby 1.8.6 (2007-09-24 patchlevel 111) [x86_64-linux]. By default, the bash configuration in Ubuntu includes a path to /usr/local/bin. That’s why the above statements work out of the box without changes to your shell configuration. If this command only returns the string success the installation is working as intended. To speed up the compilation process you can skip the documentation generation step make install-doc by removing it from the above make line. Again you can test the installation with which gem and gem -v. It should be located in /usr/local/bin. And then I installed rails, mongrel and the other stuff according to your instructions. It was perfect. Anders, while your approach works, it is not really necessary to do a complete manual re-install. You just need to remove the 'development gems' that have infected your system (rails 2.0.2.9216). To my surprise, I just got the same error today on my mail rails development machine, after creating a new rails project. And then when I did a 'gem sources list', I found the offending http://gems.rubyonrails.org listed. I am embarrassed to say I don't know how it got there, but there it was, and 'gem list' also showed all the rails gems has being installed with both version 2.0.2 and 2.0.2.9216. So, fixing it was easy. I removed the source with 'sudo gem sources -r http://gems.rubyonrails.org' and then removed all the development gems with commands like 'sudo gem uninstall rails -v 2.0.2.9216' (repeated for all rails gems). Then I created a new project and everything worked fine. So it is possible to fix this problem without a heavy duty manual reinstall of rails. I think I've found out where the development gems source is coming from. I just did a 'sudo gem update' command, and to my amazement, it re-included the http://gems.rubyonrails.org source and re-installed the development version of rails (2.0.2.9216). So it seems the upgrade to rubygems 1.1.1 has decided to automatically include that source. "/usr/bin/gem:23: uninitialized constant Gem::GemRunner (NameError)"
I removed the old gem by hand (sudo mv gem gem_old), created the link, and then all the gem commands worked. I've tested this now on Ubuntu 9.04, and it worked in most cases. I was unable to get eclipse 3.4.2 to work, but everything was fine with 3.3.2. One possible change was the aptana download location, but just check at http://www.aptana.com for the latest information. This was fixed by the command sudo apt-get install xulrunner as discussed on the blog 'Fixing Eclipse after the Firefox 3 rc1 update in Ubuntu 8.04'. I have updated the instructions above to include this information. It is great stuff about ruby on rails development services and a must read for ruby on rails consultants .